On Saturday May 16 the Palestine Solidarity Campaign (PSC) organized a mass rally in Trafalgar Square in the city of London, to commemorate the Palestinian Nakba [catastrophe] that took place in 1948 by the creation of the State of Israel. 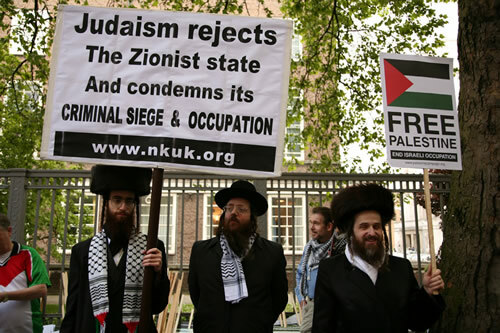 Amongst the many participants, members of Neturei Karta of UK, Jews United Against Zionism where present, to express the difference between Judaism and Zionism, to clarify that Zionism is a rebellion against the Almighty, according to the Torah, Jews are in a divinely decreed exile and are forbidden to create their own State. 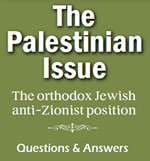 Also they where condemning the evil acts of the State of Israel against the Palestinian people, on the grounds of Jewish teachings which dictate compassion and forbids murder.